Traditional crafts that had been passed from mother to daughter began to lose interest in the 1920’s. Girls were less interested in crafts such as embroidery, crocheting, tatting, tapestry, rug making, macrame, and lace making. Even though traditional crafts such as knitting, sewing, crocheting, millinery, and quilting were popular other popular activities included beading, pyrography stenciling, sealing wax, china painting, leather craft, , and weaving. A craft that became very popular in the 1920’s was making paper flowers, these fake flowers could be used to decorate the home and make it feel welcoming without the hassle of real flowers. Another craft that was popular in the 1920s was window transparencies which were basically faux stained glass windows made of tissue paper. This made the area more majestic then before. Crafts like these could be found in magazines, books and a few other forms of media. 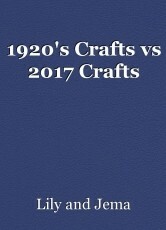 Crafts popular in 2017 were things such as desk or vanity organizers, cute room or home decor, jewelry, cloths, furniture, computer covers, clothing patches, slime and stress toys. Anything that you could make that came from tumblr, pinterest or instagram. One craft that was extremely popular for a while was slime which is a mixture of glue, borax, and water. This is a very fun toy to play with and is very customizable. Another fun craft is stress toys which are made with a balloon and a soft playable substance such as slime. You can find DIY crafts on the internet and in books and magazines. © Copyright 2019 Lily and Jema. All rights reserved. This page was created in 0.4070 seconds.